Yesterday afternoon, at the Wolverhampton Civic Hall, England, First Team Promotions (Errol Johnson and P.J.Rowson) hosted another ‘Crunchtime at Lunchtime’ Boxing event. 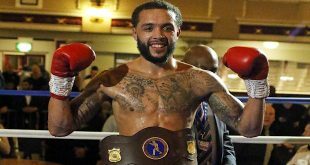 The original line-up was to include two title-bouts, Pat Bogere of Sweden and Ghanaian - Philip Kotey were scheduled to fight for the Vacant International Masters Welterweight Title and Sean McKervey was set to defend his British Masters Welterweight Title against boxing Marine – Keith Sheen, but both contests were cancelled before the weekend. First Team Promotions decided to ‘carry on regardless’ with a five-bout bill. 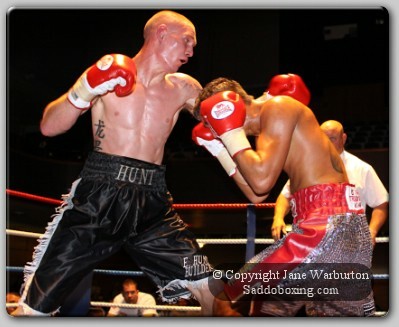 This headlining bout got off to a scrappy start with both men being warned by Referee Shaun Messer, but it was Hunt who got the stern telling off for holding and the contest was messy during most rounds. Hunt wins on points and improves to 14 wins (1 by KO) and 1 draw, while Lawler drops to 6 wins (1 by KO) 6 losses (3 by KO). 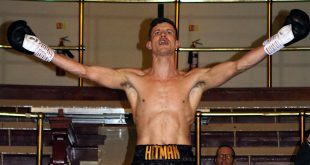 Truman seems to be looking to land a big right throughout this four rounder, but in doing so – leaves his face wide open for experienced Laight to target. But the ‘Trumanator’ finds the ‘right’ he was looking for mid-way through the second and –normally durable Laight – goes down. He catches the Nuneaton man again in the third but he remains upright and Truman gets the win on points. Truman improves to 5 wins no losses, while Laight drops to 6 wins 81 losses (4 by KO) and 6 draws. McKervey – who should have been defending his Masters Title – instead faced a determined McCauley, who looked in decent form against the Coventry man. Referee Rob Chalmers declared the contest a draw (38-38). 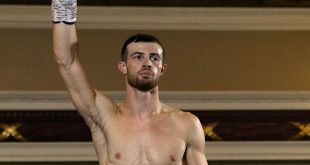 McKervey improves to 7 wins (1 by KO) 2 losses and 2 draws. 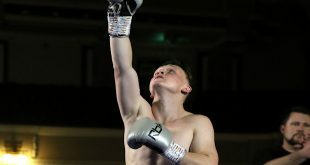 McCauley improves to 6 wins 18 losses (3 by KO) and 3 draws. Wood took some heavy punches from Brook in the third round and is pinned in to the corner by the Plymouth man, but Brook looks tired as they enter the last round. Wood is urged to keep punching right up to the bell and gets the win on points (59-57). He improves to 3 wins and 1 loss (by KO) while Brook drops to 2 wins (2 by KO) 7 losses (2 by KO) 1 draw. Mohican-haired Welborn faced experienced Welshman Brophy in this four rounder. Using his left to target the face of Brophy then the right to the body, Welborn gets the points win and improves to 4 wins (2 by KO) 1 loss (1 by KO) while Brophy drops to 3 wins 42 losses (16 by KO) and 3 Draws.